MRI is one of the most important imaging tools in clinics. It interrogates nuclei of atoms in a living subject, providing detailed delineation with high spatial and temporal resolutions. To compensate the innate low sensitivity, MRI contrast probes were developed and widely used. These are typically paramagnetic or superparamagnetic materials, functioning by reducing relaxation times of nearby protons. Previously, gadolinium(Gd)-based T1 contrast probes were dominantly used. However, it was found recently that their uses are occasionally associated with nephrogenic system fibrosis (NSF), which suggests a need of finding alternatives. Among the efforts, manganese-containing nanoparticles have attracted much attention. By careful engineering, manganese nanoparticles with comparable r1 relaxivities can be yielded. Moreover, other functionalities, be a targeting motif, a therapeutic agent or a second imaging component, can be loaded onto these nanoparticles, resulting in multifunctional nanoplatforms. Keywords: nanomedicine, MRI, manganese, contrast probes, nanoparticles, tumor imaging, theranostics. MRI is an imaging technique that interrogates nuclei of atoms inside a living body. It is one of the most frequently used imaging tools in daily clinics, allowing diagnosis to be performed in a noninvasive and real-time manner . Its excellent soft tissue contrast makes it a complement to many other imaging modalities, such as computed tomography (CT), to afford both anatomical and functional information . While blessed with an innate high resolution, the low sensitivity of MRI often times compromises diagnosis quality. In order to improve visibility, contrast agents of various forms have been developed and used [3-5]. These agents, functioning by shortening relaxation times of nearby protons, improve the contrast between lesions and normal tissues. This leads to better imaging quality and a reduced risk of misdiagnosis. In clinics, the most frequently used contrast agents are gadolinium (Gd)-based agents [6-8]. Due to an extremely high toxicity, Gd-based agents are always given in a chelated form. However, several cases of nephrogenic systemic fibrosis (NSF) have been reported recently on patients taking Gd-based contrast agents [9-11]. This once again raises concerns over the safety of this class of probes [12, 13] and therefore, spurring a new wave of exploit for non-Gd replacements . As a metal ion with comparable T1 contrast ability, Mn and its derivatives are regarded as promising alternatives. As a matter of fact, Mn-based agents have shown better performances than Gd-based ones in certain disease detection, such as for pancreatic lesions . The emergence of nanoparticle-based materials has added fuel to such an effort. With a size of several to hundreds of nanometers, nanomaterials are significantly larger than small molecules, allowing the loading of multiple copies of them. On the other hand, they are small enough to pass through many biological barriers and able to interact with a biological system at the molecular level. Through decades of research, it is believed that the technology has evolved to a level that allows the construction of nanoscale materials in a controlled manner. We can now synthesize nanoparticles, by chemical, physical or biological means, with accurate control over many parameters, including their size, shape, composition and surface nature. Tailoring these parameters, in turn, gives us the ability to tune particles' physical properties, such as their ability to induce contrast in MRI. Previously, iron oxide nanoparticles have been studied as T2/T2* contrast agents [16-20], especially for imaging reticuloendothelial system (RES) organs like the liver, spleen and lymph nodes [4, 19]. However, iron oxide nanoparticles induce hypointensities. Such a negative contrast may be confused with areas of innate hypointensities, such as hemorrhage and blood clots, or interfered with magnetic susceptibility artifacts . Both kinds of inferences can lead to inaccurate diagnosis. Mn nanoparticle-based contrast agents, on the other hand, induce more favorable hyperintensities on a T1-weighted map [22-24]. The related exploits are more recent but have attracted much attention. In this review article, we will discuss the recent progress in this field, with an emphasis on how to engineer nanoparticles to achieve a higher r1 relaxivity. Many approaches have been developed to synthesize manganese oxide (MnO or Mn3O4) nanoparticles. One common route is to heat up oleate-Mn in a high boiling point solvent (e.g. 1-octadecene) to induce nucleation and particle growth . Such a method allows the preparation of nanoparticles with accurate size control. In one of these reports, it is shown that MnO nanoparticles from 7 to 25 nm can be prepared in large scale. One major disadvantage, however, is the water insolubility of as-synthesized products. Those nanoparticles are surface-passivated with a layer of oleic acid, and therefore, are highly hydrophobic. To address this issue, a surface modification step is needed, which transfers the as-synthesized nanoparticles to a water phase. In fact, this is a common problem shared with many other kinds of nanoparticles prepared through high temperature decomposition. Likewise, the phase transfer methods are in many cases interchangeable . Unlike T2/T2* contrast agents, the T1 contrast agents need to have direct interaction with the surrounding water protons to affect their relaxation times. For nanospheres, it means that only Mn ions on the surface are effective. With the same amount of Mn, smaller nanoparticles tend to have a larger surface percentage and therefore, higher r1 relaxivities. Indeed, when using phospholipids as the coating materials to transfer Mn nanoparticles into an aqueous solution, it was found that the 7 nm formulation, the smallest among all tested, has the highest r1. In a clinical 3.0 T magnet, r1 relaxivities were evaluated to be 0.37, 0.18, 0.13 and 0.12 mM-1s-1 for Mn nanoparticles with a diameter of 7, 15, 20 and 25 nm, respectively. In a separate study, Huang et al. used manganese stearate as the precursor and prepared MnO/Mn3O4 nanoparticles by hydrothermal decomposition. It was reported that nanoparticles down to 5 nm can be prepared by such a method, and the r1 was found over 1 mM-1s-1. Further down this path, Baek et al. prepared MnO nanoparticles of 2-3 nm using triethylene glycol as the solvent and D-glucuronic acid as the coating material. The resultant MnO nanoparticles can have an r1 as high as 7.02 mM-1s-1. Aside from the size effect, the coating material that stands between particle surface and the surroundings is considered another important factor. For instance, Huang et al. used a dopamine-plus-human serum albumin (HSA) bilayer coating to make MnO nanoparticles water soluble . In the first step, dopamine, with its adjacent hydroxyl groups, tightly bound with surface Mn to replace the original oleate coating. Subsequently, a layer of HSA was adsorbed onto the nanoparticle surface to bring in sufficient water dispensability (Figure 1). 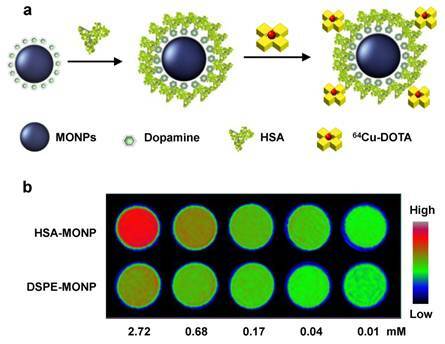 From the same batch of as-synthesized MnO nanoparticles, they then used both dopamine-plus-HSA and phospholipids to make MnO nanoparticles water soluble. It was found that particles yielded from the former strategy induced an r1 that is over five times higher than from the latter, phospholipid-coated one (1.97 vs. 0.37 mM-1s-1 for 20 nm MnO nanoparticles). Although the detailed mechanism is unknown, it is believed that the more hydrophilic bilayer is essential. Unlike in the case of phospholipids, where a hydrophobic zone exists between particle surface and the aqueous surroundings, both dopamine and HSA are hydrophilic materials and allows efficient water penetration. a) Schematic illustration of the dopamine-plus-HSA coating strategy. b) Phantom studies with nanoparticles coated with HSA (the first row) and phospholipids (the second row). At the same Mn concentration, HSA coated MnO nanoparticles showed much higher hyperintensities. Reproduced with permission from Ref. . The advanced synthetic technology also allows the preparation of composite nanoparticles. For instance, the synthesis of Au-MnO nanoparticles with either a flower-like shape or a dumbbell-like shape was reported [28, 29]. It typically starts with Au nanoparticles, and subsequently grows MnO petals on top of these seeds. Schladt et al. used a multidentate copolymer carrying catechol anchors and PEG linkers to replace the original hydrophobic coating on Au-MnO nanoflowers. The resulting nanoparticles are water soluble and showed an r1 of 0.224 mM-1s-1. Such a relatively low r1 can be explained by the fact that a large part of MnO is hinged with Au nanoparticles and is not accessible to water. An advantage of using such a composite nanostructure is that it has two surface types and can be functionalized dually. While the MnO have high affinity with catechol and its derivatives, the Au particles can be easily modified with thiolated species. In theory, two types of functionalities can be loaded without causing cross-species interference. As a proof-of-concept study, 4-chloro-7-nitrobenzofurazan (NBD) and a Texas red tagged 24-mer oligonucleotide were loaded separately onto the MnO and Au surface of Au-MnO nanoflowers . As mentioned above, an increased nanoparticle surface percentage can lead to a higher r1. Instead of reducing the nanoparticle size, it is also possible to achieve this goal by converting particles into a hollowed structure. It was reported that treating MnO nanoparticles at high temperature (300 ˚C) in technical grade trioctylphosphine oxide can lead to the formation of MnO nanohollows. It was later revealed that the impurities, mostly alkylphosphonic acid, were playing a role as an etching agent . Further characterizations found that an inward diffusion of phosphorus and an outward diffusion of manganese took place in the intermediate stages during the etching, a so-called Kirkendall effect. This generated a void within the original nanoparticle (Figure 2). The resultant nanostructures retained the size and shape uniformity of the original nanocrystals but have significantly increased water accessibility. For 20 nm MnO nanoparticles, this treatment can increase r1 from 0.353 to 1.15 mM-1s-1. An alternative way of forming MnO hollowed nanostructures is to incubate water soluble MnO nanoparticles in a phthalate buffer (pH 4.6, r.t.) for 12 h. This will not affect the coating but will etch away part of the MnO interior to induce a void. For 20 nm MnO NPs, it was reported that an r1 as high as 1.42 mM-1s-1 can be achieved . Instead of adopting an organic coating, MnO nanoparticles can also be coated with a layer of silica. There are at least two folds of merits with silica coatings. First, silica is a biocompatible material. Second, silica coating allows easy functionality loading, either onto the particle surface or into the silica framework. Dyes, photosensitizers and many other kinds of functionalities can be pre-conjugated with silane derivatives, such as 3-aminopropyltrimethoxysilane (APTMS), and loaded at high rate into silica matrices. However, intact silica coating is too dense to allow efficient water infiltration. To overcome this issue, Peng et al. developed an etching process to induce a mesoporous structure and to improve water permeability. It was achieved by incubating silica-coated MnO nanoparticles with ethylacetate and sodium hydroxide at 60˚C. Such a mesoporous structure allows water molecules to move in through the pores and interact with the surface Mn (MnO@mSiO2). More excitingly, further treatment under this condition can lead to corrosion of the imbedded MnO cores, generating hollowed cores (H-MnO@mSiO2). As mentioned above, this hollowed structure can further improve r1 relaxivites. Indeed, MnO nanoparticles with intact silica coatings only have an r1 of 0.07 mM-1s-1. Such a figure was found increased to 0.16 mM-1s-1 for MnO@mSiO2 and 0.2 mM-1s-1 for H-MnO@mSiO2 . In a separate study, Kim et al. used a different approach to induce porous structure. They introduced cetyl trimethylammonium bromide (CTAB) along with tetraethyl orthosilicate (TEOS) during a silica sol-gel reaction process. CTAB served as the organic structure-directing template . Later on, when incubated in refluxing ethanol solutions (pH = 2.4), such a CTAB template was removed, leaving pores in the silica matrices (Figure 3). Like in the above case, such a treatment in acid environment also led to the formation of a hollowed nanostructure. For 15 nm MnO nanoparticles, it was reported that an r1 of 1.72 mM-1s-1 can be achieved. 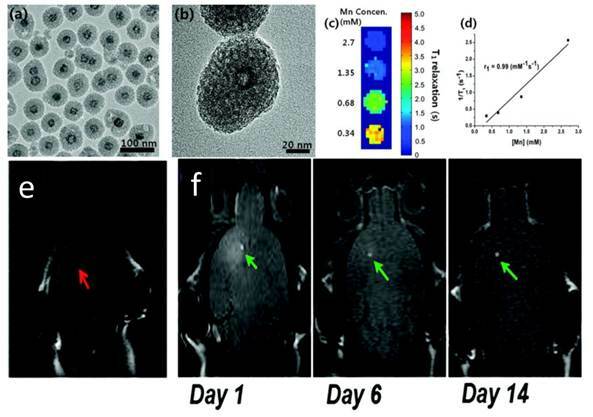 The resulting mesoporous silica-coated hollow manganese oxide (HMnO@mSiO2) nanoparticles are able to efficiently label adipose-derived mesenchymal stem cells (MSCs) and to facilitate the tracking of MSCs in vivo by MRI (Figure 3). Compared with MnO nanohollows with an organic coating, it is obvious that the silica coated ones have slightly lower r1 relaxivities. This is not surprising considering a higher surface coverage rate of the latter. On the other hand, silica coating affords a scaffold effect which stabilizes the nanohollow structure. This brings a better morphology control and less worry on the nanostructure collapse. Last but not least, the well-established silica engineering techniques allow the easy loading of various types of functionalities. Organic dyes, inorganic fluorophores, small molecule drugs, peptides, antibodies and siRNA have all been loaded onto silica coated nanoparticles, independent of the nature of cores [19, 33]. TEM images taken a) before and b) after the etching process. Voids were generated inside the nanostructures. c) Suggested mechanism for the generation of voids. 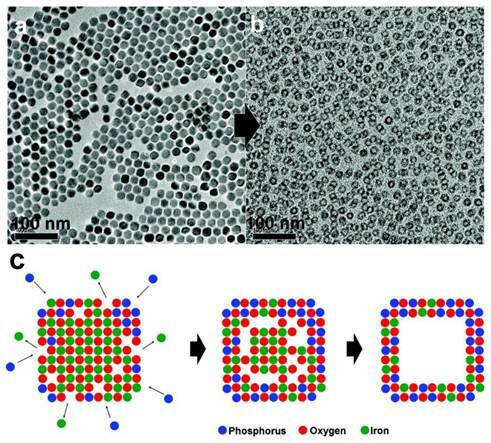 An inward diffusion of phosphorus and an outward diffusion of manganese took place at the same time, leading to the formation of a void in the nanostructure. Reproduced with permission from Ref. .
Characterizations of HMnO@mSiO2 nanoparticles. a) TEM image. b) HRTEM image of a single nanoparticle. c) T1 map of HMnO@mSiO2 nanoparticles suspended in water at 11.7 T. d) Plot of 1/T1 versus Mn concentration. The slope indicates the specific relaxivity (r1). e-f) In vivo MRI of transplanted MSCs. e) No hyperintense signal (red arrow) was detected in mouse transplanted with unlabeled MSCs. f) Hyperintense signals (green arrows) were detected in mouse transplanted with HMnO@mSiO2-labeled MSCs and were still detectable 14 days after the injection. Reproduced with permission from Ref. . Instead of engineering manganese oxide nanoparticles, it is also possible to arrive at Mn-based probes by doping free Mn cations or incorporating Mn complexes into other nanoscaffolds. Previously, Niesman et al. has loaded MnCl2 into liposomes and used them as liver specific contrast agents . It was shown from toxicity studies that the effective dose of such a complex was 7 to 11 times lower than the LD50 of free MnCl2. In rats with implanted liver tumors, those particles induced a two- to three-fold increase in the relaxation rate of liver while having little effect on the tumor relaxation rate, making this formulation a potential contrast agent for liver metastasis imaging . In a separate study, Pan et al. loaded Mn(III), in the form of a porphyrin complex, onto a nanobialy constructed by amphiphilic branched polyethylenimine (PEI) . Such an amphiphilic PEI was achieved from alkylating PEI10k with linoleic acid. The resultant PEI can self-assemble into a toroidal shape with low polydisperisity. Mn(III)-protoporphyrin chloride (Mn-PPC) can be easily incorporated into such an inverted micellar structure (Figure 4). Most Mn-PPC was found at the surface of the nanostructure, a feature that is essential for water accessibility. Under a 1.5 T magnet, an r1 of 3.7 mM-1s-1 was recorded. Such a nanobialy structure can be further loaded with small drug molecules, such as camptothecin or doxorubicin, with high efficiency (98 ± 0.1 % and 99 ± 0.1% for doxorubicin and camptothecin, respectively). It is therefore regarded as a potential theranostic nanoplatform, having both diagnostic and therapeutic values. Another example is Mn-oleate based nanocolloids reported by Pan et al. In brief, Mn-oleate was suspended with polysorbates (e.g. sorbitan sesquioleate) and homogenized with a mixture of surfactants, mainly comprised of phosphatidylcholine (PC) (~90 mol%) and biotin-caproyl-PE (~1%). This leads to the formation of a nanocolloid with a hydrodynamic size of 134 ± 2 nm. Under a 3.0 T magnet, the r1 was evaluated to be 14.6 ± 1.1 mM-1s-1. Recently, silicon-based quantum dots (QDs) have attracted much attention. Compared to the previously used QDs, Si QDs are more favorable for their better biocompatibility and biodegradability . It was reported recently that Mn can be doped into such a system to achieve probes with MRI/optical dual functionalities. For preparation, a high-energy mill was used to ball-mill mixtures of NaH, Si and Mn powders with an appropriate molar ratio. Such a mixture was placed into an alumina crucible with a lid which was placed into a quartz tube. It was then heated at 420˚C for 2 days followed by heating at 500˚C for 1 additional day under flowing nitrogen. The yielded sodium silicide (Mn-doped) was used as a precursor and heated to reflux for 2h in DMF with the presence of NH4Br and allylamine. The resultant nanoparticles can be dispersed in water and can be further stabilized by adding a dextran sulfate or dextran coating. Two-photon excitation found a peak at 790 nm, which is in the near-infrared region and therefore, has optimum tissue penetration. These nanoparticles demonstrated a very high r1 relaxivity at 25.50 ± 1.44 mM-1s-1. Recently, Mn-containing metal-organic framework was constructed by Taylor et al. and was studied as an MRI contrast probe . Unlike the above-mentioned nanocrystals, such a nanostructure is not metal-oxide-based. It was synthesized by using either terephthalic acid (BDC) or trimesic acid (BTC) as a bridging ligand. Then through a reverse-phase microemulsion process, Mn(II) complexed with the bridging ligands and grew into a nanorod structure (Figure 5). These nanoparticles, too, can be easily coated with silica and further loaded with other functionalities. The resultant nanoparticles demonstrated good r1 relaxivities (5.5 mM-1s-1 under 3.0 T and 4.6 mM-1s-1 under 9.4 T). Like many other nanoplatforms, Mn particles can be coupled with different kinds of functionalities and upgraded to multifunctional nanogadgets. For instance, it is possible to conjugate a targeting motif, such as a peptide [40, 41] or an antibody , onto nanoparticles to gift them targeting specificity. In one of these studies, MnO nanoparticles were coupled with Herceptin, an antibody that targets human epidermal growth factor receptor 2 (HER2) [42, 43]. The conjugates, after i.v. injected, were able to home to breast cancer metastasis in the brain. It is believed that the blood brain barrier (BBB), which blocks the infiltration of particles into the brain, was destructed at the tumor site. While both non-functionalized and functionalized nanoparticles can penetrate BBB, only the Herceptin conjugated ones were able to home to the tumor sites. It is also possible to put other imaging components onto nanoparticles to achieve multimodality imaging probes. It was mentioned above that Mn can be doped into a silicon QD matrix to achieve dually functional imaging probes with both MRI and optical imaging capabilities. From an in vitro analysis, they found that these nanoparticles can be efficiently taken up by macrophages without dramatically affecting the cells' viability. The particle-labeled cells can be easily recognized by both MRI and two-photon optical imaging, suggesting their potential as cell labeling reagents . Therapeutics of various forms can also be loaded onto Mn-based nanoplatforms. Choi et al. loaded doxorubicin, via electrostatic interaction, onto silica coated MnO nanoparticles. These nanoparticles were further loaded into a 3-D poly(propylene fumarate) (PPF) scaffold. It was found that the release of doxorubicin into the surroundings can be tracked by both MR and optical imaging . Shin et al. demonstrated that doxorubicin can be loaded into hollow MnO nanoparticles at 202 µg/mole particle, a rate which is much higher than into intact MnO nanoparticles (58 µg/mole particle). Doxorubicin is amphiphatic, and in principle a hydrophobic molecule. It is believed that the hydrophobic-hydrophobic interaction between doxorubicin and the oleic acid coating is the main cause of the loading. With higher oleic acid coverage, the hollowed nanostructure affords a higher coating capacity . In another important study, Viglianti et al. loaded both MnSO4 and doxorubicin into a liposome formulation (Figure 6). It is believed that two doxorubicin molecules are coordinated to each Mn2+ cation within the liposome, where water molecules have limited accessibility. The release of Mn into the surroundings is found associated with significant T1 shortening and this feature was studied as a means to monitor the in vivo drug release. The drug release was triggered by inducing heat to tumors. When using a thermal sensitive liposome formulation, it was found clearly that the drug release occurred preferentially at the periphery of tumors (Figure 6). This pattern was concordant with the release temperature of the formulation (39-40˚C). As a control, a nonthermally sensitive formulation was also tested. While selective tumor accumulation was also observed, a heterogeneous drug distribution pattern was found in such a case . Later on, the same group studied whether the timing of liposome administration is critical to the drug release. It was found that doxorubicin was accumulated more rapidly and efficiently if the formulation was injected during rather than before the hyperthermia . Linoleic acid modified PEI can self-assemble into a toroidal shape nanostructure. Mn(III)-protoporphyrin chloride (Mn-PPC) was able to be incorporated into such an inverted micellar structure. Under a 1.5 T magnet, an r1 of 3.7 mM-1s-1 was recorded. Reproduced with permission from Ref. .
SEM images of a) Mn(BDC)(H2O)2 nanorods and b) Mn3(BTC)2(H2O)6 spiral nanorods. 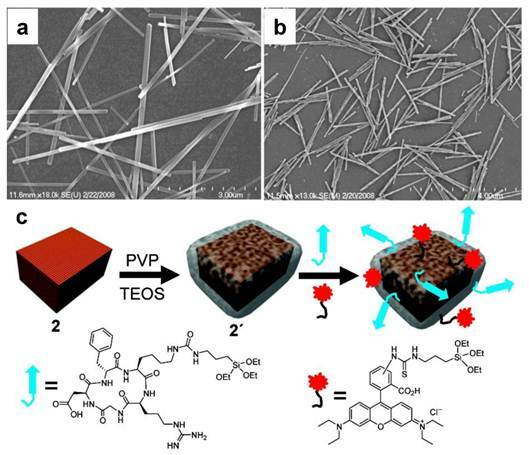 c) Nanorods can be surface-functionalized with PVP and then coated with a thin layer of silica. Other functionalities, such as peptides and dye molecules, can be as well loaded onto the silica coating. Reproduced with permission from Ref. .
a) Schematic depiction of a temperature-sensitive liposome containing doxorubicin (Dox) and contrast agent (manganese sulfate, MnSO4). The phospholipid bilayer undergoes a main melting phase transition at 41 °C, which leads to the release of contents. DPPC = 1,2 dipalmitoyl-sn-glycerol-3-phosphocholine; MSPC = 1-stearoyl-2-hydroxy-sn-glycero-3-phosphocholine. b-e) MRI axial images of rats with transplanted flank fibrosarcomas treated with doxorubicin/Mn containing liposomes. b) LTSL with HT, c) LTSL without HT, d) NTSL with HT, and e) NTSL without HT from 0-90 min. LTSL = lysolipid-based temperature-sensitive liposomes; HT = hyperthermia; NTSL = non-temperature-sensitive liposomes. Reproduced with permission from Ref. and . Very recently, Bae et al. demonstrated the possibility of loading siRNA onto hollow MnO nanoparticles. They coupled 3,4-dihydroxy-L-phenylalanine with polyethylenimine(PEI) and used the resultant conjugate as an adhesive moiety to modify the hollow MnO particle surface. Herceptin was loaded via chemical conjugation. On the other hand, siRNA was loaded by electrostatically interacting with the polycation coating. They demonstrated at the in vitro level that the resultant conjugates can selectively target HER2 overexpressed cells and induce silencing of the target gene . One major concern of using Mn-based nanoparticles is their cellular toxicity. Manganese is considered as an essential metal for biological systems, working as a cofactor for a number of key enzymes [48, 49]. However, high concentrations of Mn is associated with neurotoxicity. This includes progressive and permanent neurodegenerative disorders, altogether termed as manganism, which resembles Parkinsonism in many ways [50, 51]. Nonetheless, Mn formulations have been used frequently in clinics to help improve the quality of MR imaging. MnCl2, for instance, is an FDA approved contrast agent. Due to its ability to enter excitable cells through voltage-gated calcium channels, it is widely used in MRI to demarcate active regions of the brain [52, 53]. In small animal studies, it was recommended that doses higher than 93 mg/kg and 38 mg/kg should not be used for rats and mice, respectively . However, a much higher dose was used with manageable adverse effects [55, 56]. Chelated Mn is considered much safer than free Mn(II). Mangafodipir trisodium (MnDnnP), for instance, is another FDA approved formulation, used extensively in hepatobiliary MRI [57, 58]. It is believed that its structural similarity to vitamin B6 is one of the main factors for its high hepatocyte uptake . It is noted, however, that Mn(II) can be released from the complex through metabolism. Those released cations accumulate in the liver, pancreas and cardiac muscle and cause hyperintensities. At suggested does, however, those released Mn will not cause dramatic side effects. On the other hand, relatively little attention has been paid to the toxicity of Mn-doped nanoparticles. So far, most research in this area has been satisfied with in vitro viability assays. It was claimed by many that Mn-doped nanoparticles, be a silica matrix or a metal-organic framework, are safer than Mn chelators, since the Mn are less likely released during circulation. However, these nanoparticles, with a larger size, cannot be secreted through renal clearance and may stay in a living subject for a long period of time. What is the metabolism route and how the daughter compounds interact with a biological system is largely unknown at this point. A similar issue was found in the research on manganese oxide-based formulations. One common argument is that Mn is in a crystallized form in MnO or Mn3O4 nanoparticles and does not easily fall off. Indeed, viability studies have shown that cells can tolerate these nanoparticles to a certain degree. MnO nanoparticles have even been used for labeling and tracking transplanted cells . However, cytotoxicity studies provide limited information on the long-term impact. At the end of the analysis (typically within 72 h), many nanoparticles are still in the process of decomposing in an acidic endosome/lysosome environment. Systematic studies are needed to better understand the detailed particle metabolism and their long-term effects to a living subject, especially from a neurotoxicity perspective. Mn-based nanoparticles are a relative new class of materials. Unlike the other well-studied nanoparticles, such as iron oxides , research on Mn-based nanoparticles is at a relatively early stage. Much more work has to be done to promote this new class of materials in a nanomedicine context. Several key parameters include their T1 contrast ability and their distribution in a living subject, either with or without a targeting motif. To estimate their translation potential, more efforts should be put on accessing the biosafety of Mn-based nanoparticles. The current analysis-of-standard is in vitro viability assay . At this stage, little is known about the nanoparticles' metabolism and the long-term side effects to a living subject. Also, it is worthwhile to perform a side-by-side comparison with both Gd- and iron oxide-based formulations to assess the advantages of Mn-based nanoparticles, if there is any. Supported by NIH grant R00 4R00CA153772.